After letting the second runner dry for about 24 hours, I removed it from the clamping form and discovered that it turned out even better than the first runner! Since this project has been my first attempt at making bent laminations, I've definitely picked up some techniques and tricks that make the process much smoother. I think if I had to make a couple more runners, I'd be a pro! Too bad I only need the two for this project. They match! I never had ANY doubts! Here's a video of me flattening one edge of one of the runners on the jointer. Have I mentioned lately that I love this machine??? And here's a clip of me flattening one edge of one of the splats. Then a few quick passes through the planer to clean up the opposite edges of the runners and splats. Here are the back splats all squared up and ready to have the edges rounded over. After milling a piece of stock down to 1 1/2" thick, I used the arm template to trace two opposite arms onto the board. 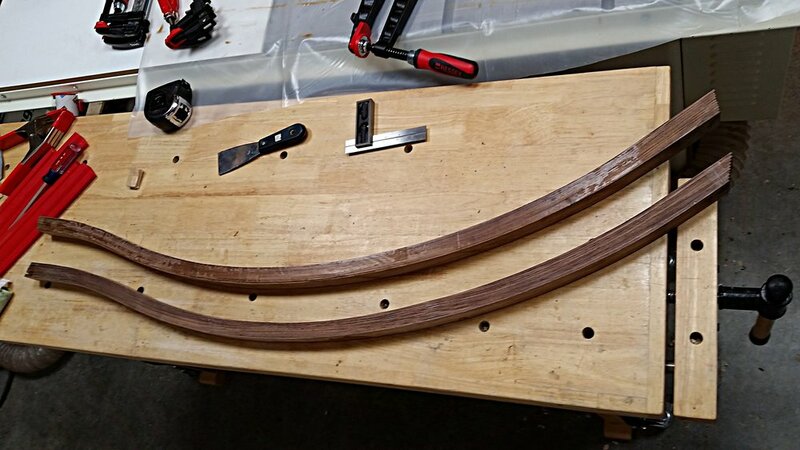 I put the new 1/4" bandsaw blade to work and cut out the two arm blanks. Then a few minutes on the spindle sander to smooth the edges, and BAM, I now have two arms ready to go. Here are all the chair parts that I've made so far. All in all, I'm super happy with my progress so far. 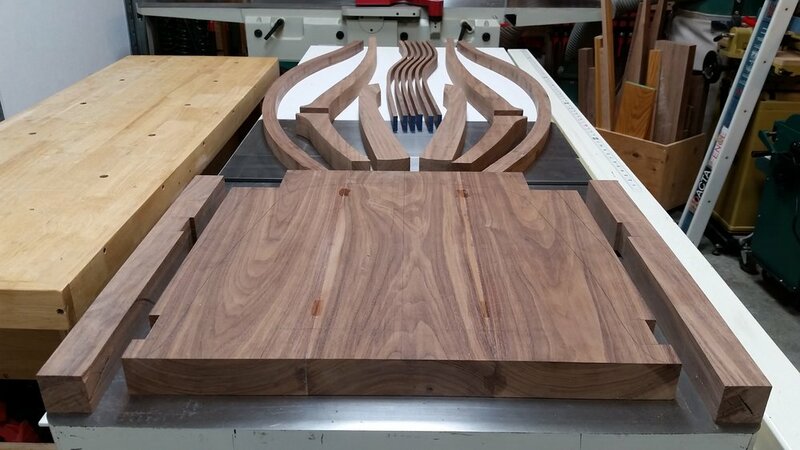 From here, it's just a matter of refining each individual part and then fitting them together into a usable piece of furniture. So really, this thing is practically done already... ha ha!